Already at the age of 8, my biggest dream was to be on stage, performing in front of a large audience. I began taking piano lessons at the age of 10, and when I was 18 I had my first encounter with the accordion and with Klezmer music. I immediately got hocked on the compelling, melancholic sound of the accordion and dynamic possibilities of the bellow, and the Eastern european folk music styles became the starting point of my expression as a musician. After two years of preperational education, I started The World music pedagogic programme on the Academy of Music and Drama in Gothenburg, in 2002. 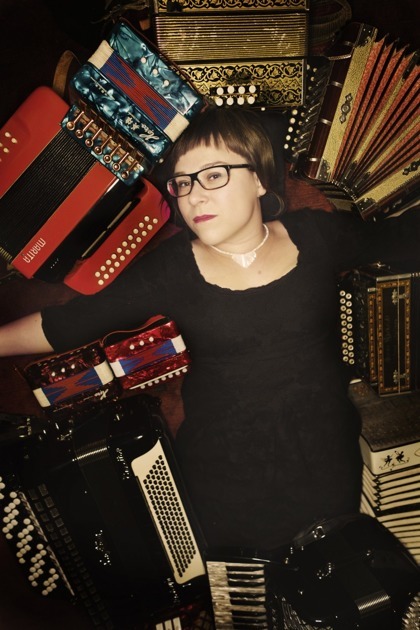 I began freelancing as an accordionist in an increasing number of contexts and groups, performing Klezmer, Balkan Music, pop, reggae, Chilean folk music, different mixes of world music and lot of experimental styles. Uptil now, I have performed at all kinds of venues and occasions, playing on festivals, churches, cafées, culture and concert houses and private parties as well as on Swedish National TV and Radio. I have toured in Sweden and in Norway, Denmark, Germany, Holland, Belgium, Canada, and South Korea. Trio Kaja, in which I compose most of the tunes, are supported byThe Swedish Arts Council, and both in 2012 and 2013, I got grants supporting my work from the Swedish Arts Grants Committee. At the moment, I am freelancing as an accordionist and a composer, as well as being part of a number of different groups and long term projects. See more on Constellations. I compose for the trio Kaja, for Trio Phantasm, my solo project Visor för frågvisa, Gothenburg Yiddish Orchestra etc. I have also made music for the shows Riddar Blåskägg and Midvintervaka. Apart from playing accordion and composing, I also sing, play the piano and write lyrics. Since 2006 I run my own firm as a freelance artist and accordion teacher.